LG Electronics is launching the 100 inch Laser TV – a throw projector system which requires just 22 inches of clearance from the wall – in the US next month. 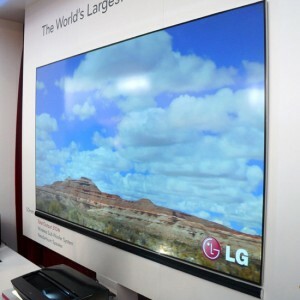 The LG Laser TV creates a giant 100-inch class HD 1080p resolution picture. The LG Laser TV will be available in mid-April with a suggested retail price of $8,999. The Laser TV also incorporates LG’s Smart TV platform with built in Wi-Fi, offering access to content providers like Netflix and YouTube as well as the LG app store.